Lack of trust between the Russians and the Americans is a fundamental obstacle to reaching an understanding that could resolve the Syrian conflict. 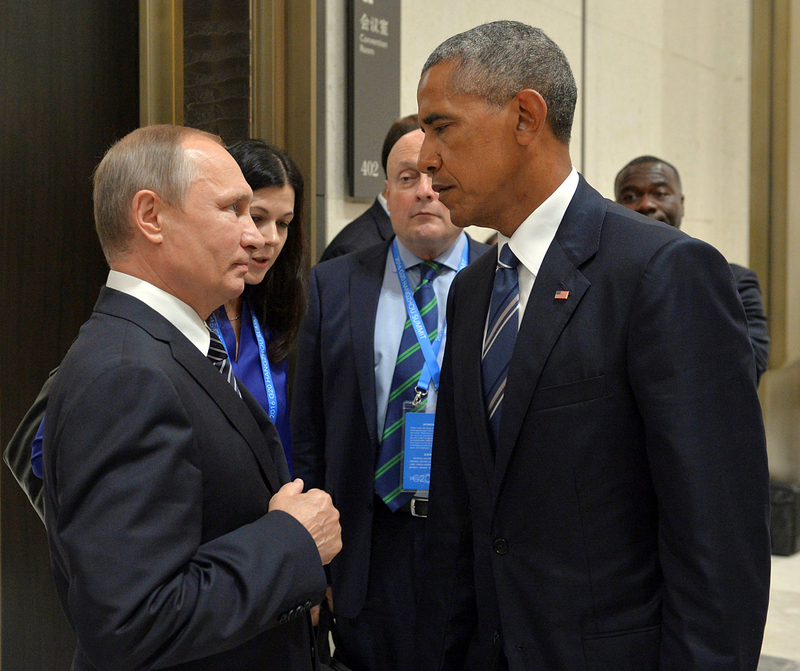 Photo: Russian President Vladimir Putin meets with U.S. President Barack Obama on the sidelines of the G20 Summit in Hangzhou, China, on Spet. 5, 2016.
International experts have expressed pessimism about the prospects for improving Russia-U.S. relations, urging leaders in Moscow and Washington to remain cautious while dealing with each other in Syria. The Syrian conflict is stoking mistrust between Russia and the U.S. that will be difficult to overcome in the near future, participants of a special panel on Russia-U.S. relations organized in Moscow by the Valdai Club international discussion forum have concluded. Former UK Defense Minister Desmond Browne (2006-2008) and former UK ambassador to Russia Roderic Lyne (2000-2004) joined Robert Legvold, Professor Emeritus at Columbia University and a prominent expert on Russia, on Sept. 30 in Moscow to discuss why Russia-U.S. relations have deteriorated so much recently. According to Legvold, the Syrian conflict is turning into a proxy war between Russia and the U.S. in the eyes of the American public. Less than a week after the discussion in Moscow, on Oct. 3, the U.S. State Department announced its decision to terminate dialogue with Moscow on Syria, as if fulfilling the grim predictions of the participants. Russia, in turn, responded (in Russian) by arguing the Obama administration was either unable or unwilling to fulfil key conditions of continued cooperation with Moscow on Syria. “…what’s happened in Syria is the mistrust overwhelmed the chance to build trust, and now Syria is going to become rather than a positive influence and a way to move forward in this current, what I call Cold War, it’s now going to contribute to the deepening of the Cold War,” said Legvold. Lack of trust between the Russians and the Americans is a fundamental obstacle to reaching an understanding that could resolve the protracted conflict, along with the sides’ inability to fully exert their influence on the conflicting parties in Syria, according to the experts. By 2015, said Legvold, senior staff in the Obama administration had concluded that Moscow saw the U.S. as actively pursuing the strategy of regime change in various countries. Hence the U.S. and Russia developed an inherent sense of mistrust with regard to each other’s intentions that later manifested itself particularly evidently in Ukraine and Syria. According to experts, the conflicts in Syria and Ukraine are hotspots that could put Moscow and Washington into an open conflict, should the sides fail to behave more cautiously. “The first thing we need to do collectively is to [refrain] from actions that make the situation worse. Ukraine and Syria are particular hotspots. If the leaderships of East and West want better relations then they’ve got to start behaving with some restraint in those areas,” said Roderic Lyne, former UK ambassador to Russia. Desmond Browne, who served as the British Defense Minister at the time the Russian-Georgian conflict broke out, said that the August war of 2008 was a “collective wake-up call” that both Russia and the West chose to ignore, thus laying the foundations for future conflicts. “It did seem to me that unless we address this issue of trust and confidence, form some form of a dialogue and a common perception of at least the dangers we were engaging with, then other things were likely to happen,” said Browne. Although the experts were largely pessimistic about the current state of relations between Russia and the U.S., they agreed that Moscow and Washington could still try to put relations back on track by focusing on the common challenges the two countries share. “We can identify a number of issues on which we continue to have common interests,” said Lyne, pointing out the North Korean nuclear program as an area of particular concern. “Just as we we able to work together on Iran we need to work together on [North Korea]. Then we need to start addressing issues that have driven us apart, which is going to be a slow process because it is not only about interests, it is about values,” added the former diplomat. According to the pundits at the panel in Moscow, Russia and the U.S. can still revive their former bond if the leaders in Moscow and Washington do not further aggravate the current mistrust, which is similar to that which prevailed during the heights of the Cold War. However, Washington’s decision to terminate bilateral dialogue with Moscow on Syria leaves little hope for now.